If you’ve travelled in a City Cabs taxi recently, then you may have noticed stickers promoting our FREE onboard WiFi. We know how important it is that we stay connected which is why we have decided to supply each of our vehicles with built-in WiFi units. We know how frustrating it can be when you’re having difficulty getting connected through your mobile network, so we’ve created the network, CityCabs1. Check your emails, browse social media and check the news all in the space of a few seconds. Make sure your WiFi is switched on, search for ‘CityCabs1‘ and enter ‘#2281211‘ as the password and that’s you connected. 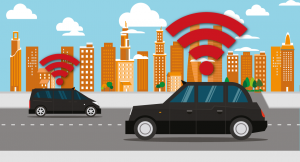 City Cabs are jumping into the digital age head first, and WiFi is just another addition to our already impressive features. This move will secure City Cabs as Scotland’s first taxi company to offer WiFi across their entire fleet. From Edinburgh Airport to Princes Street or the Royal Mile to Leith, passengers can stay connected when travelling with City Cabs. If you experience any issues connecting to our WiFi, then please get in touch. We may experience a few teething problems, and your input would be appreciated. Email marketing@citycabs.co.uk with the number of the taxi you are in and details of the problem. Call us on 0131 228 1211 or download our app on iPhone and Android. Using our app allows you to book, track your taxi and even pay by card. For more info click HERE.